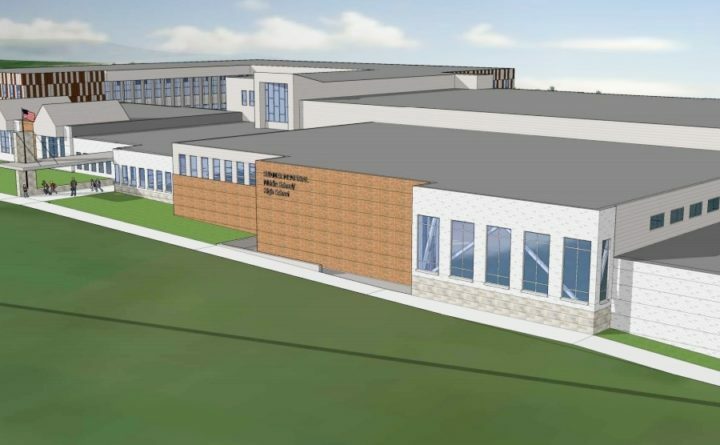 An illustration of a preliminary design for a new Sumner Memorial High School in Sullivan. Officials with RSU 24 say the goal is to have the building constructed before the start of the 2022-2023 academic year. Residents from several towns in eastern Hancock County showed their support Wednesday night for a proposal to build a new $45 million, combined middle and high school in Sullivan. Roughly 60 residents participated in an informal straw poll vote, and they supported the proposed new school 46-11. The school would serve roughly 500 students in grades 6 through 12 from the nine towns that make up Regional School Unit 24. It would replace the current Sumner Memorial High School on Route 1, which was built in the early 1950s, and middle school-age students from RSU 24’s four K-8 schools would move to the new school. With the preliminary support in the straw poll, RSU 24 officials now intend to put the proposal up for a formal district-wide vote on June 11, which is the same day member towns will vote on the RSU’s proposed budget for the 2019-20 academic year. RSU 24 serves Eastbrook, Franklin, Gouldsboro, Mariaville, Sorrento, Steuben, Sullivan, Waltham and Winter Harbor. The informal straw poll was taken after RSU officials and Lyndon Keck, a Portland-based architect who has developed plans for the proposed 105,000 square-foot school, fielded questions from area residents gathered in the Sumner Memorial High School cafeteria for about an hour. Of the projected $45 million cost, the RSU would have to fund roughly $1 million directly, either through municipal property taxes or local fundraising. The Maine Department of Education would fund the remaining $44 million — or approximately 98 percent. “This is a turn-key operation,” Keck said, adding that $35 million would go just to construction costs, and another $10 million would cover expenses such as equipment, administrative costs, required contingency funds, fees and professional services. Keck said that the proposed building could be expanded to accommodate more students down the road if enrollment increases beyond current projections. At 500 students, the new combined middle-and-high school would be about twice as big as Sumner, which has approximately 240 students. RSU 24 Superintendent Michael Eastman has said the purpose of placing the district’s middle-school students in the new school is to consolidate more of the district’s operations with the goal of reducing costs. None of the district’s four existing K-8 schools is projected to close as a result of the new 6-12 school, he said. They simply will become K-5 schools. RSU 24’s enrollment, currently about 870 students, is not expected to change significantly over the next decade, according to Eastman. If the proposal is approved in June, the goal would be to have the new school open for the 2022-23 academic year. The new building would be constructed on the same lot behind the current high school, which would remain in use while construction takes place. The existing building would be demolished and replaced with an athletic field in the summer of 2023. Eastman said a simple majority of voters in the RSU’s nine member towns is needed to approve the project. Even if a majority of voters in an individual town oppose the project, it will pass if a district-wide majority votes in support of it. If most voters in the RSU towns reject the proposal, however, it could be many years before the Department of Education again offers to substantially fund the cost of a new district high school. “If it doesn’t pass, the [$44 million] gets allocated toward another project” somewhere else, Keck said. Roy Gott of Franklin, chairman of the RSU’s board of directors, said after Wednesday’s straw poll that the nine-member board unanimously supports the $45 million proposal. The new school, if built, would be expected to meet the RSU’s needs for grades 6 through 12 for the next 75 years, he said.